LOME, Togo - The African Union threatened sanctions Tuesday against Togo as opposition grew abroad and at home to the army's installation of the son of the West African nation's longtime leader as president. The United States endorsed a call by the African Union and Economic Community of West African States to bring about peaceful resolution in Togo that "will lead to free and fair elections to select a new president." Faure Gnassingbe, 39, took power with the army's backing on Saturday, just hours after the death of his father, Gnassingbe Eyadema, Africa's longest reigning ruler. He was sworn in Monday after parliament changed the constitutional rule of succession. Security forces turned back hundreds of protesting students who had tried to disrupt the swearing-in. A general strike Tuesday closed markets, schools and businesses in southern parts of the capital. "Togo is not a hereditary monarchy," protester Emmanuel Akwetey said at his Lome home, skipping a day at his welding job. "The army and parliament have no right to impose the son of president Eyadema on the people." The Peace and Security Council of the 53-nation African Union, which condemned the army's appointment of Gnassingbe as a military coup, threatened unspecified sanctions unless "authorities fail to ensure the rapid restoration of constitutional legality." "The manner through which the de facto Togolese authorities organized the succession in Togo ... constitutes a blatant and unacceptable violation of the Togolese constitution," the council said in a statement. 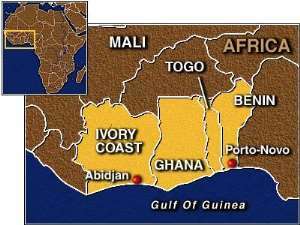 On Wednesday, the Economic Community of West African States, known as ECOWAS, is expected to hold an emergency meeting in Niamey, Niger, to discuss the change of power in Togo, which is also a member of the 15-nation body. In Washington, State Department spokesman Adam Ereli said the United States was looking forward to proposals from the ECOWAS summit. African Union support, along with that of former colonial powers France and Britain, is crucial for Gnassingbe. Without it, he risks international isolation and a lack of diplomatic recognition that could turn Togo into a pariah state. The British Foreign Office also denounced the handover of power, urging Togolese authorities "to arrange for early, credible and democratic presidential elections." France issued similar calls. Eyadema seized power in a bloodless 1967 coup after leading sub-Saharan Africa's first postcolonial military coup four years earlier. He ruled for 38 years, longer than any other living world leader, except Fidel Castro. The military installed his son as president even though the constitution stipulates that the parliament speaker is next in line. In an extraordinary session on Sunday, the 81-member national assembly approved Gnassingbe as speaker by a vote of 67-14, then voted to change the constitution to allow him to fulfill his father's term, which expires in 2008. France, Togo's colonial ruler along with Britain until 1960, put its troops in the region on alert to protect its 2,500 citizens in the West African nation of 5.5 million. Britain advised its citizens not to travel here. Information Minister Piteng Tchalla accused opposition leaders of exploiting Eyadema's death by calling a strike "when they should be expressing their sympathies for the deceased."